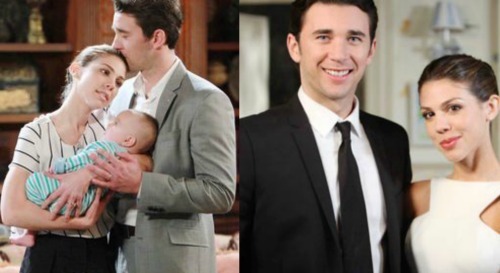 Days of Our Lives (DOOL) spoilers tease that Abigail Deveraux (Kate Mansi) will soon have reason to soften up towards Chad DiMera (Billy Flynn). She’s been giving Chad the cold shoulder ever since he ripped Charlotte from her arms and sent her back to Bayview. Abigail found that act unforgivable, and she’s shunned Chad ever since. But soon, a shocking development will arise that will bring Abigail and Chad together for a common cause. Charlotte will be kidnapped by Jordan Ridgeway (Chrishell Hartley), and both Abigail and Chad will be beside themselves with worry. Of course, they won’t know who the kidnapper is, so Chad will explore various leads. First, Chad will confront Stefan DiMera (Tyler Christopher), thinking he could be behind the kidnapping. It wasn’t that long ago that Stefan thought Charlotte was his child, so Chad will think that perhaps Stefan nabbed Charlotte as payback. But it will soon become apparent that Stefan’s moved on and is not the one behind the kidnapping. From there, Chad will corner Ben Weston (Robert Scott Wilson), thinking he’s the culprit. Ben ran off with Thomas DiMera (Asher Morissette) right after he was born, so naturally Chad will assume that Ben might have snapped again and taken Charlotte. Of course, Ben will deny being involved in Charlotte’ kidnapping, and he’ll urge Chad to move on and look for the real kidnapper. Thankfully, it won’t be long before the real kidnapper is revealed, and Charlotte is rescued from Jordan. It looks like Chad will be on hand for the rescue, and he’ll be able to bring little Charlotte home to Abigail. It will be a moment of healing and family bonding as Chad, Abigail, and Charlotte are reunited. It will also be a turning point in Abigail and Chad’s relationship. Once Abigail gets Charlotte back in her arms, she’ll have overwhelming feelings of love and gratitude toward Chad for his relentless search. She’ll realize that what’s important is that her kids have a dad who loves and cherishes them, and that forgiveness is in order. Of course, according to Days of Our Live spoilers by CDL, Chad and Abigail will be leaving Salem soon. Perhaps they’ll figure they need to get some distance from everything that’s happened over the past year, with Abigail’s Dissociative Identity Disorder, Stefan, and now Charlotte’s kidnapping. It looks like they’re definitely on the path to reuniting, which is great news for “Chabby” fans. Are you glad that Abigail is going to forgive Chad? Stay tuned to DOOL and don’t forget to check CDL often for the latest Days of Our Lives spoilers, updates, and news.